Speechless! Maine’s logging, forest products, and trucking industries are the heart of Maine. And each year, they look deep within themselves to make sure Maine’s future has access to the very best healthcare, close to home. Last night, the Professional Logging Contractors of Maine hosted their annual Dinner and Auction at Jeff’s Catering in Brewer. 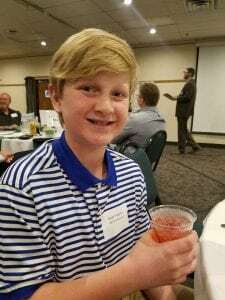 It was a great night, highlighted by Scott Hanington and Noah Tibbetts, Children’s Miracle Network Hospitals 2014 State of Maine Champion Child, auctioning off flies Noah tied. The inspiring evening raised more than $46,000 to help make miracles happen for Maine kids. A super thanks to these incredible superheroes.